Sergio Ramos could reportedly seek a fresh challenge away from Real Madrid, should ex-Manchester United boss Jose Mourinho return to the club's dugout at the end of the season. Los Blancos are presently under the guidance of Santiago Solari, who penned a permanent contract after succeeding Julen Lopetegui at the helm of things earlier in the campaign. 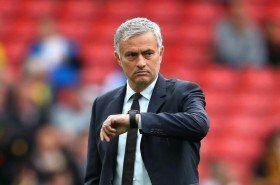 Despite this, Mourinho has been widely fancied to return as the club's manager when the season concludes but Mundo Deportivo suggests that the move could directly affect the future of club-captain Ramos. The Spain international had a rather mixed relationship with Mourinho during their time together at Los Blancos between 2010 and 2013 and it appears that the centre-back does not fancy a reunion with the Portuguese. Real Madrid have experienced a difficult season in the Spanish top-flight this term and they are currently eight points adrift of leaders Barcelona with an extra game in hand. In the Champions League, they have gone through a similar patch with a couple of disappointing defeats to CSKA, though they comfortably progressed to the last 16 stage of the competition.